Microsoft released updates for the company’s Windows operating system, Microsoft Office, and other company products on today’s February 2018 Patch Day. Our overview lists all important information to make it as easy as possible to keep an overview, download updates, look up additional information, and make better decisions in regards to the installation of updates. It is recommended that you back up your system before you install any patches. The past has shown over and over again that updates may have negative effects on systems and that backups are the best option when it comes to rolling back. Our guide lists all security and non-security updates that Microsoft released since the January Patch Day. Each patch is listed with its name, description, and link to Microsoft. We list how Windows products and Microsoft browsers are affected by this month’s updates, post known issues and security advisories. You find information on downloads and even direct links to downloads at the end of the article. Microsoft released updates for all supported client and server versions of Windows. Security updates are available for Microsoft Office, Adobe Flash, Microsoft Edge and Internet Explorer as well. All Windows systems are affected by one critical vulnerability. 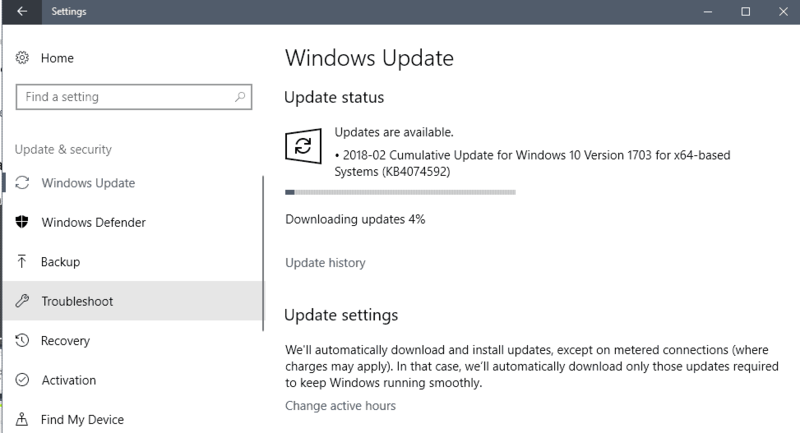 KB4074588 — Cumulative Update for Windwos 10 version 1709 to build 16299.248. Addresses issue with fragment identifier contained in links opened using the Enterprise Mode Site List to redirect from Microsoft Edge to Internet Explorer. Addresses issue with rendering graphics elements with Internet Explorer. Addresses issue with browser Compatibility View settings that occured during updates. Addresses issue where a failover in MPIO while throttling input and output requests may cause all available paths to fail. Addresses issue where the application pool CPU throttles when running IIS. Updates Microsoft HoloLens CPU Microcode to address vulnerability CVE-2017-5715 – Branch target injection. Installing this KB for HoloLens applies all relevant OS and Microcode updates. See Advisory 180002 for more details. Editing some group policies using GPMC or AGPM 4.0 may fail with the error “The data present in the reparse point buffer is invalid. (Exception from HRESULT: 0x80071128)”. Security updates to Microsoft Edge, Internet Explorer, Adobe Flash Player, Microsoft Windows Search Component, Windows Kernel, Device Guard, Common Log File System Driver, and Windows storage and file systems. KB4074592 — Cumulative Update for Windows 10 Version 1703 to build 15063.909. KB4034044 — Security Update for Windows Server 2008 and Windows XP Embedded that fixes an information disclosure vulnerability in VBScript. KB4058165 — 2018-02 Security Update for Windows Server 2008 — addresses a security issue in Windows Kernel that could be abused for information disclosure attacks. KB4073079 — 2018-02 Security Update for Windows Server 2008 — addresses an elevation of privileges vulnerability in the Windows Common Log File System driver. KB4073080 — 2018-02 Security Update for Windows Server 2008 — Fixes an information disclosure vulnerability and an elevation of privilege vulnerability in Windows kernel. Windows Update History reports that KB4054517 failed to install because of error 0x80070643. — Workaround: run a manual check for updates to make sure no further updates are available. A big non-security update with improvements and fixes. Fixes lots of issues including unbootable state issues for some AMD systems, printing PDF issues in Microsoft Edge, or Windows Defender security issues. The update includes quality improvements. Lots of fixes, some match KB4057144. Non-security update for the November update version of Windows 10. Includes some fixes. Microsoft released non-security updates for Office products last week. Check out this overview if you have not already. KB4011686 — Fixes remote code execution vulnerabilities in Office 2016. KB4011143 –Fixes remote code execution vulnerabilities in Office 2016. KB4011690 — Patches vulnerabilities in Microsoft Office that could be exploited for remote code execution. KB3172459 — Security Update for Microsoft Office to address remote code execution vulnerabilities. KB4011707 — Fixes remote code execution vulnerabilities in Office 2010. KB3114874 — Fixes remote code execution vulnerabilities in Office 2010. All security updates for Windows are distributed via Windows Update and other update distributions services already. Users who want to install the updates right away may need to run manual checks for updates as these don’t happen in real-time. Tap on the Windows-key, type Windwos Update and select the result. Windows will either run a check automatically when the page opens, or after you select “check for updates”. Updates should get downloaded and installed automatically after the scan. If they are not, click on the download button to start the process. The following links point to the Microsoft Update Catalog website where you can download the updates as standalone files.